Jun 30, '08 2008 39th Annual World Series of Poker Event 51 - H.O.R.S.E. Phillip Penn Sr. raised to 5,000 from middle position and was re-raised by Michael Binger on his left. Penn made the call and they saw a flop of 6 3 3 . Penn checked and Binger bet. Penn called. The turn was the J , and again Penn checked. Binger bet 5,000 and Penn check-raised him. Binger called, and then called another bet on the K river. Penn Sr. turned over 6 6 for a flopped full house. Binger showed his A A and, infuriated with the recent development, stormed away from the table, hitting a chair in the process. Binger was down to only 10,000 after that hand. Binger, in good shape, stood up and awaited the river card. The dealer laid out an 8 and Binger stared at the board for a moment to make sure what he saw was accurate: Penn hit one of his few outs to make a straight. As could be predicted, Binger was not happy, and he stormed from the table once again, this time for good. Those two hands have propelled Penn to the chip lead with 125,000. Action folded around to Esther Rossi in the small blind who completed the bet and Jan Suchanek told the dealer, “Let’s go.” The dealer scooped in the two players’ blinds... and then Suchanek threw in a raise. Apparently, Suchanek’s declaration of “Let’s go” was intended as the precursor to a raise and not an indication of a check. After some squabbling between Rossi and Suchanek with the dealer serving as a slightly biased arbiter (after all, nobody likes admitting to a mistake) the floor was called over. After what seemed like hours of explanation to the dealer of what had transpired, it was ruled that uttering the phrase “Let’s go” alone does not indicate a check and that the raise would stand. After all of that was settled, there was some poker to be played. The dealer put out a flop of A 10 6 and Rossi check-called a bet from Suchanek. Action went check-call again on the K turn, and then both players checked the 10 on the river. Suchanek showed A 4 4 3 for a pair of aces and that was good enough to take down the pot. Rossi, with 48,000, still has a bit more chips than Suchanek, who has 30,000. Tommy Hang raised from the cutoff and Chad Brown re-raised from the small blind. Hang called and the two of them saw a flop. The flop came down Q J 3 . Brown bet, Hang raised, and Brown called. The turn was the Q and Brown checked to Hang. Hang bet and was quickly raised by Brown. Hang called, and then again called on the 9 river. Brown triumphantly showed A A and Hang mucked his hand. Victor Ramdin raised pre-flop and was called by James Schaaf in late position. Both players checked the 10 9 5 flop. Ramdin then check-called a bet on the K turn. On the river (9 ), Ramdin checked for the third time, eliciting a bet from Schaaf. On this street, however, Ramdin raised. Schaaf glowered, knowing that he was beat, and slid his cards into the muck. The hand brings Ramdin up to 33,000. On a flop of J J 7 , Mike Matusow moved his final 6,000 chips in from the big blind. David Gee and Steven Diano both called. The turn was the 9 and Gee bet, Diano raised, Gee 3-bet, and Diano called. While this was going on, Mike Matusow was announcing to Phil Hellmuth at an adjacent table that he was about to be knocked out. On the river (6 ) Gee bet and Diano called. Diano asked, “Do you have J-9?” Gee turned over two of his cards: a jack and a nine. Diano angrily threw his J-7 toward the middle of the table. Mike Matusow, meanwhile, was busy showing everyone within view his A A 8 2 , saying that if he was going out, that at least he was going out getting most of his chips in pre-flop with that hand. With Matusow’s exit, the room will be a little more subdued, but much less interesting. Eugene Katchalov was all-in pre-flop against three opponents. Two players made it to showdown and they showed K K Q 3 and A 10 5 2 ; the former had a pair of kings for high and the latter had the nut low. Katchalov, who had stood up and shook his neighbor’s hand before the river had even been dealt, was, predictably, eliminated. The flop was A 10 6 , the turn was the 10 , at which point Hellmuth notified the table (and, judging by the volume of his voice, several nearby tables) that he had already clinched the high. The river was the 2 , which did not deliver Sjavik a low, and he was eliminated. Hellmuth is now up to 60,000. The player in the 6 seat completed showing the 3 and Michael Binger called in the 1 seat with the 4 . The 6 seat, drawing a 4 on fourth street, bet into the Binger, who had paired his four. Binger called. His opponent then bet fifth street. 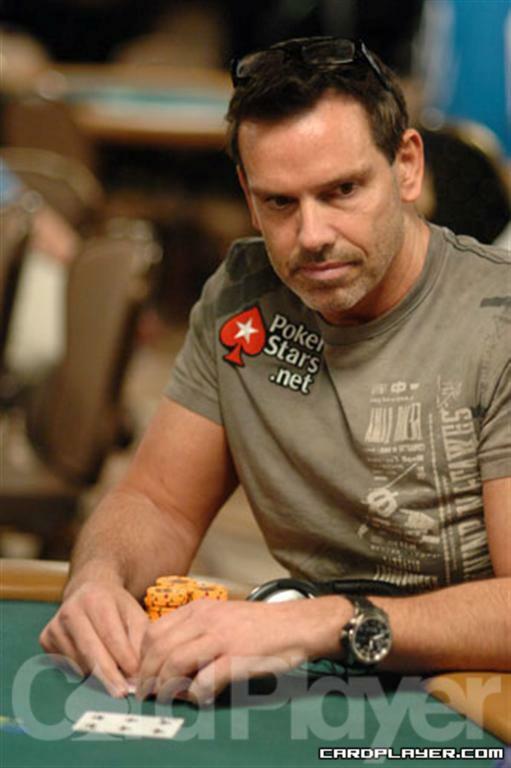 Binger angrily fired his up cards face-down onto the table and conceded the hand. Binger is now down to 20,000. David Gee raised and Saro Getzoyan repopped the starting price. Gee called and the flop was dealt J 6 4 . Getzoyan bet and Gee called. The 3 was peeled off the deck on the turn and Gee raised. Getzoyan called and the river brought the 4 . Getzoyan flipped over pocket aces, and Gee turned over pocket kings. Gee slammed his fist on the table when fortune failed to smile upon him. The pot gave Getzoyan $880,000 and Gee was knocked down to 100,000. Gee moved in the last of his chips with K 7 a few hand later. Hansen called with10 10 . Any hope that Gee had of surviving was crushed by the 10 on the river. Gee was eliminated in fifth place and he took home $68,850 in prize money. William Thorsson raised and Sanford made the call. Hansen also called and the flop came Q 8 8 and Thorsson led out. Hansen called and then Sanford raised. Thorsson called, but Hansen evacuated the situation. The K was dealt on the turn and Sanford led out for $60,000. Thorsson raised and Sanford called. The 7 rolled on the river and this time Sanford check-called a bet from Thorsson. Thorsson turned over 8 7 for the full house and Sanford mucked his cards. 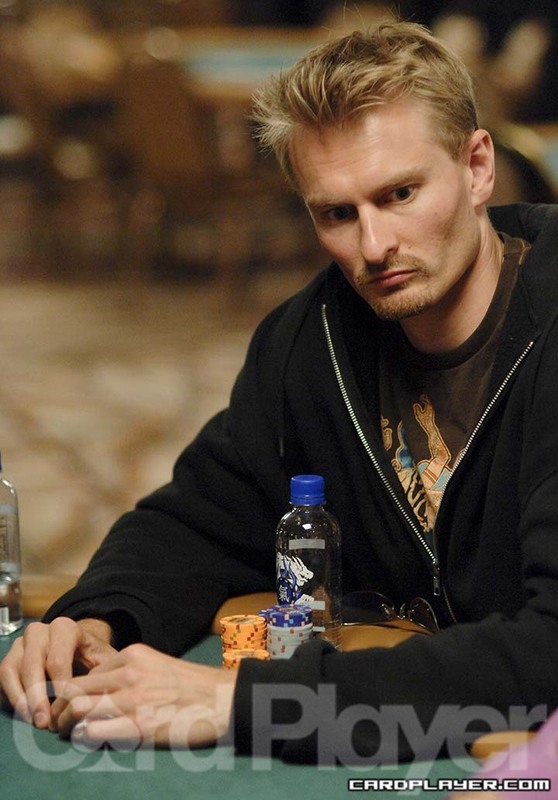 Thor Hansen continued to grow his chip stack during this stretch and he was now close to the chip lead. He already owns two gold bracelets and could add a third here tonight. The players then went on a fifteen minute break. Tom Koral limped and David Gee checked. The flop was dealt 10 9 7 and Gee check-raised Koral, who made the call. The turn brought the Q and Gee bet the remainder of his chips. Koral called and Gee turned over 10 9 for two pair. Koral flipped over Q J , but he received no help when the 5 hit on the river. Gee doubled up on the hand to survive. The atmosphere surrounding the limit hold’em world championship is a unique one to say the least. First of all, it was shoved into a corner behind the ‘No Limit Lounge' and right next to the World Series of Poker Live set. It is also peculiarly quiet as play continues into the evening. The crowd might be better suited to the links of Augusta at the Masters, than they are for the Rio. We’ll see if this changes, as excitement should increase with more eliminations. David Gee raised $40,000 and Tom Koral made the call. The flop came 10 8 2 , and Koral checked. Gee bet and Koral check-raised. Gee called and 9 was dealt on the turn. Koral bet the last of his chips and Gee called. When the dust settled, Koral was all in and he flipped over pocket sevens. Gee made a straight with the nine on the turn and Koral was eliminated in sixth place. He took home $54,356 in prize money. Geoff Sanford raised from the button and Thor Hansen called in the big blind. Hansen called Sanford down on every street, while the board was dealt 7 3 2 7 8 . Sanford was all in at this point and turned over J 8 . Hansen mucked.